Vote for your favourite Mentholatum Acnes Ultimate Ulzzang to stand a chance to win a pair GV tickets! 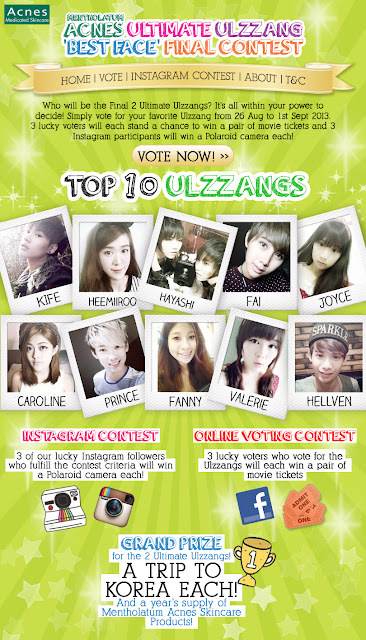 Vote for your favorite Ulzzang and stand a chance to win a pair of movie tickets! P.S I've got a little freebie to share with all of you! Lastly, Mentholatum is having an INSTAGRAM CONTEST! 5. TAG ‘Acnes Medicated Skincare Sg’ Instagram account. 3 winners will be selected and each wins a Polaroid Camera!